For members who are only attending the annual member meeting and not the dinner portion of the evening. TDMAW Members, Partners & Sponsors are invited to Alioto's Restaurant for dinner and presentation by Keynote Speaker, back by popular demand, Historian John Gurda. John will present: Milwaukee: A City Built on Water. Learn about Milwaukee's use and abuse of Lake Michigan and the rivers that feed into it. Immediately preceding the dinner meeting, TDMAW members are invited to our annual meeting, to finalize voting for the 2019 Board and discuss 2018 accomplishments and our vision for 2019. Telling tales of brewers, brickmakers, ecologists, and engineers, Gurda explores the city’s complicated connection with its most precious resource and greatest challenge. You’ll meet the generations of people, from a Potawatomi chief to fur traders and fishermen, who settled on the small spit of land known as Jones Island; learn how Milwaukee’s unique water composition creates its distinct cream-colored bricks; visit Wisconsin’s first waterparks; and see how city leaders transformed the Milwaukee River—once described as a “vast sewer” with an “odorous tide”—into today’s lively and lovely Riverwalk. Still have Christmas shopping to do? 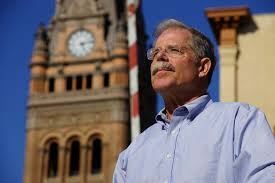 John will have his book, Milwaukee: A city Built on Water, for sale for $30 including tax. Special guests: Four MATC students and their instructor will share their IMTS experiences with our group. 5:30 PM (MEMBER Only Annual meeting): *Members only* meet in the West Dining Room for networking, committee reports and vote for the 2019 Board of Directors. 6:30 PM: Members, Partners, Sponsors and guests join together for dinner and presentation by Historian John Gurda. $35, includes one drink ticket. If you plan to attend the 5:30 member only meeting ONLY, there is no cost but registration is required.